BAGHDAD, Iraq - As enraged crowds protested the hanging of Saddam Hussein across Iraq's Sunni heartland Monday, government officials reported that 16,273 Iraqi civilians, soldiers and police died violent deaths in 2006, a figure larger than an independent Associated Press count for the year by more than 2,500. The tabulation by the Iraqi ministries of Health, Defense and Interior, showed that 14,298 civilians, 1,348 police and 627 soldiers were killed in the violence that raged in the country last year. The Associated Press accounting, gleaned from daily news reports from Baghdad, arrived at a total of 13,738 deaths. The United Nations has said as many as 100 Iraqis die violently each day, which translates into 36,500 deaths annually. In Samarra, a mob broke the locks off a bomb-damaged Shiite shrine and marched through carrying a mock coffin and photo of the dictator. The demonstration in the Golden Dome, shattered in a bombing by Sunni extremists 10 months ago, suggests that many Sunni Arabs may now more actively support the small number of Sunni militants fighting the country's Shiite-dominated government. The Feb. 22 bombing of the shrine triggered the current cycle of retaliatory attacks between Sunnis and Shiia, in the form of daily bombings, kidnappings and murders. Monday's protest came on a day that saw the US military kill six Iraqis during a raid on the offices of a prominent Sunni political figure, who was suspected of giving al-Qaida in Iraq fighters sanctuary. Until Saddam's execution Saturday, most Sunnis sympathized with militants but avoided taking a direct role in the sectarian conflict - despite attacks by Shiite militia that have killed thousands of Sunnis or driven them from their homes. The current Sunni protests, which appear to be building, could signal a spreading militancy. Sunnis were not only outraged by Saddam's hurried execution, just four days after an appeals court upheld his conviction and sentence. Many were also incensed by the unruly scene in the execution chamber, captured on video, in which Saddam was taunted with chants of "Muqtada, Muqtada, Muqtada." The chants referred to Muqtada al-Sadr, a firebrand Shiite cleric who runs one of Iraq's most violent religious militias. He is a major power behind the government of Shiite Prime Minister Nouri al-Maliki. Many Sunnis are also upset that Saddam was put to death the day that Sunni celebrations began for Eid al-Ahda, a major Muslim festival. The judge who first presided over the case that resulted in Saddam's death sentence said the former dictator's execution at the start of Eid was illegal according to Iraqi law, and contradicted Islamic custom. The law states that "no verdict should implemented during the official holidays or religious festivals," said Judge Rizgar Mohammed Amin, a Kurd. Rizgar presided over Saddam's trial on charges he killed 148 Shiite men and boys in Dujail, north of Baghdad, in a botched assassination attempt in 1982. The judge was removed from the case after Shiite complaints that he was too lenient. "The Baath party and Baathists still exist in Iraq, and nobody can marginalize it," said Samir al-Obaidi, 48, who attended a Saddam memorial in the Azamiyah neighborhood. Mourners at a mosque in Saddam's hometown of Tikrit slaughtered sheep as a sacrifice for their former leader. The mosque's walls were lined with condolence cards from tribes in southern Iraq and Jordan who were unable to travel to the memorial. Saddam's eldest daughter briefly attended a protest Monday in Jordan - her first public appearance since her father was hanged. "God bless you, and I thank you for honoring Saddam, the martyr," said Raghad Saddam Hussein, according to two witnesses. She addressed members of the Professional Associations - an umbrella group of unions representing doctors, engineers and lawyers - in the group's office parking lot in west Amman. In the midst of the protests, US forces continued operations in Iraq. Six Iraqis were killed in a US-led raid on the Baghdad offices of a top Sunni politician, Saleh al-Mutlaq. 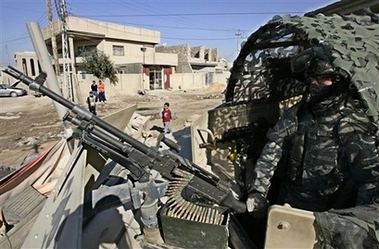 The US military and Iraqi police said they suspected the offices were being used as an al-Qaida safe house. Al-Mutlaq is a senior member of the National Dialogue Front, which holds 11 of the 275 seats in Iraq's parliament. US forces said they took on heavy fire from automatic weapons and rocket-propelled grenades as they sought to enter the building. Ground troops were backed by helicopters that "engaged the enemy with precision point target machine gun fire," the military said. The US death toll, meanwhile, climbed to at least 3,002 by the final day of 2006 as the American military reported the deaths of two more soldiers in an explosion Sunday in Diyala Province, northeast of the capital. With the announcement, the Associated Press count of fatalities showed that at least 113 US service members died in December. That makes it bloodiest month of 2006. Iraqi authorities Monday reported that 16,273 Iraqis - including 14,298 civilians, 1,348 police and 627 soldiers - died violent deaths in 2006. The total exceeds the Associated Press count by more than 2,500.